Know a kid that likes weaponry? Know a kid that's fascinated with knights or ninjas? Know somebody of any age who doesn't (yet) know they like swords? Hand them this book. Ben Boos has created a book filled with hundreds of pictures of all kinds of swords. They are gorgeous. The book's organized into short sections that show different weaponry from particular time periods and for particular warriors. He includes information about which fighters might use which weapons and how sword design affected the type of fighting the weapon is used for. He covers fighters from berserkers to knights to samurai to ninjas and lots of others. He also provides information on the development of swords and how inventions like stirrups or steel affected weaponry and fighting. Check out Ben Boos's blog, read an interview with him at Omnivoracious, and read another review at Guys Lit Wire. 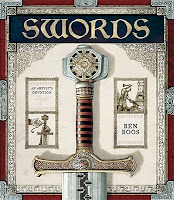 Swords is a Cybils finalist in the Middle Grade/YA Non-Fiction category. Happy Non-Fiction Monday! (And Happy MLK Day, too!) The roundup for NFM is over at Simply Science today, so go check out what the kidlitosphere is reading this week! I love this book so much! I never even thought about Caldecott contention, but it definitely has some of the best illustrations I've ever seen. I was glad to see it on the Cybils shortlist! This sounds great-- I will put it on my list. This really is a gorgeous book! I happened to see it on our "new" shelf while seeking books for a pair of ravenous readers who love all things medieval -- Ranger's Apprentice, Rosemary Sutcliff, etc. -- and was instantly impressed. I hope the boys were, too! The boys love this one, and it is beautifully illustrated. My only objection was there wasn't a whole lot to read in it.